Strips of chicken breast are tossed with spiced rice, flaked almonds, sliced apple, cherry tomatoes and long stem broccoli to make a colourful, filling and portable lunch. Simply pack into a plastic container, pop into a cool bag with a couple of ice blocks and keep well chilled. With a GI of 51, this meal is <a href=_http_/www.bbc.co.uk/food/collections/high-protein_low-gi_recipes__high.html protein, low GI</a> and provides 354 kcal per portion. Half-fill a medium saucepan with water and bring to the boil. Add the rice and one teaspoon of curry powder. Cook for 25 minutes, or until tender. Add the broccoli and cook for a further two minutes. Drain in a colander and rinse under cold running water until cold. Meanwhile half-fill a small saucepan with water, add the stock cube and bring to the boil, stirring until the stock dissolves. Add the chicken, the sliced onion and bay leaf and reduce the heat. Simmer for 15 minutes or until the chicken is cooked through. Drain in a sieve, reserving the cooking liquor. Set the chicken aside to cool. Return the pan to the heat, spray with oil and add the chopped onion. Cook over a low heat for three minutes, stirring. Add the remaining curry powder and stir for a further few seconds. Pour 200ml/7fl oz of reserved cooking liquor into the pan and bring to a simmer. Cook the onion for 5-6 minutes, or until most of the liquid has evaporated, stirring occasionally. Remove from the heat, spread across a plate and leave to cool for five minutes before transferring to the fridge until cold. Tear the chicken into pieces and place in a bowl. 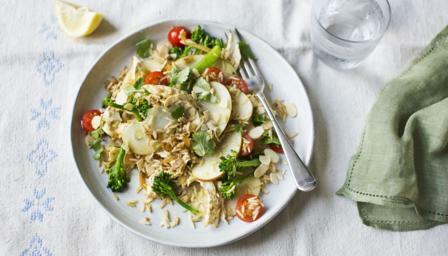 Tip the rice and broccoli on top, add the cooled spiced onions, almonds, apple and tomatoes. Scatter with the coriander and sprinkle with lemon juice. Season to taste and serve.